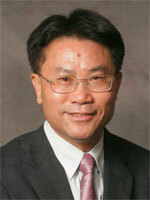 Professor Leonard Kwok-Hon Cheng joined the Department of Economics in July 1992 as Reader in Economics (a British academic title that ceased to exist after HKUST adopted the US academic titles) and left in September 2013 to become President of Lingnan University. From the late 1990s onward, the Department has been recognized as among the best in Asia and ranked well in the world from the early 2000s. What attracted Prof. Cheng to return to HKUST from the US, where he was an Associate Professor at the University of Florida? According to Leonard, it was primarily due to Prof. Francis T. Lui, who by joining HKUST in 1991 was a founding member of the Department. At the time, Leonard was looking to relocate from Gainesville, the location of University of Florida, of to a bigger city in the US for a more wholesome life. He was aware of HKUST’s establishment as a new university, but was planning to visit it after he had found a new job and settled down. At the annual AEA meeting at the end of 1991, Francis persuaded Leonard to come to Clear Water Bay to take a look at the campus for himself and without making any commitment on either side. So in March 1992 Leonard came back to HKUST to give a seminar and to meet with colleagues who joined the HKUST Business School (this particular name was adopted many years later as part of the School’s branding effort). He liked what he saw, a beautiful seaside campus, but more important he learned that several of his friends in academia (but outside economics and some even outside business) in the US had already joined HKUST or were planning to do so to work together to build a serious research university by Western standards, the first of its kind in Hong Kong. So, after his campus visit, Prof. Cheng decided to join the new university located in Clear Water Bay. His seminar was not very impressive, but that didn’t prevent him from getting an offer. He wasted no time, and on June 23, 1992 he and his family arrived in Hong Kong. Prof. Lee, at Ohio State University now, is a world renowned econometrician and was ranked as the world’s top 3-4 econometricians by publications when he was with our Department during 1994-2000. At that time the Business School was the only school at HKUST with one Associate Dean; later other schools discovered value in having an associate dean and then the number of Associate Deans expanded. In a sense, Leonard regarded himself as an accidental academic administrator. Did Prof. Cheng enjoy being Department Head of Economics and Dean of the Business School (he was Acting Dean from July 2007 till February 2009, and Dean from March 2009 till August 2013)? Looking back, he said he remembered in both cases he had to deal with crises that were quite challenging. In the case of Economics, some chosen research areas grew very strong, but then later collapsed due to departure of star colleagues triggered by external rather than internal factors, throwing the Department into a crisis or near-crisis situation that required adjusting the Department’s research foci and rebuilding. In the case of the Business School, uncompetitive faculty salaries made the School a hunting ground for other business schools in Hong Kong, China, and Singapore, not to mention the US, when he became Acting Dean. “But then after the crises were dealt with successfully, I felt that the hard work was worth it.” As a hard worker, he was amused when he was once shown the slogan “Hard work beats talent”. © 2019 Economics Connection, HKUST.